A pretty cool book, and not to difficult to follow along with. My experience is with GIMP rather than Photoshop, but most all of the stuff talked about in here I was familiar with and knew how to do, I just never considered using it this way. 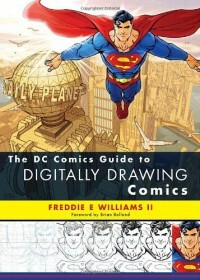 This book has made me excited about trying out digital drawing. The one downside to this book is that it stops at the inking stage and doesn't go into doing color (which, I suppose is something he doesn't do, so understandable, though it would have been nice to have had a co-author who does digital coloring to add a couple chapters about that at the end of the book. The cover illustration erroneously leads the casual browser to believe that coloring will be addressed). Overall though a good read.